A man in Mesa, Ariz., who was arrested for animal abuse and other violations, has had some charges against him reduced. Residents and pet owners are not happy. According to East Valley Tribune, Scott Graham, 39, was arrested on September 3 following a wave of cat mutilations and killings in the area. Approximately 40 felines disappeared in the past 3 to 5 years, and Graham was suspected of being the culprit after he was caught by a surveillance camera grabbing a cat off the roof of a car on August 8. 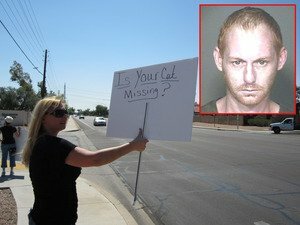 In police report posted by the Phoenix New Times, the cat’s mutilated corpse was found eight days later in the bushes behind a strip mall; a second mutilated corpse was found in the same area. A few days later, a citizen on a bicycle recognized the vehicle from the surveillance video. When the driver realized he was being followed, he pulled over, threw a cat out the driver’s window, and sped away. The citizen got the last four digits of the license plate. On September 3, the same citizen spotted the vehicle in his neighborhood, got the full license plate number, and notified police. The police were led to Graham’s residence; he lives with his parents. Unfortunately, the Maricopa County Attorney’s Office claims there isn’t enough evidence to file animal cruelty charges against Graham, but continues to prosecute him for misdemeanor theft. In response, citizens have scheduled an “Engage the Outrage!” protest, slated to take place this Saturday. Among the missing cats is a 12-year-old white feline named Pat. According to the EVT, the animal was not only a family pet, but a habitation cat for Phillip Leger, a 25-year-old who has severe cerebral palsy. “Not only is Pat missed by our family, but he’s especially missed by Phillip,” his mother, Lenetta Leger, said to the EVT. “That cat was his best friend. When we called him to come in that night, and he didn’t come, we knew something was wrong.